So, I used to think that cockroaches were the most annoying pest ever known to man, but recently fleas have taken over as my least favorite pest. I have been working on eradicating them from my apartment over the last few days. The Flea Eradication Effort (FEE) is progressing well, I think, though now everytime I enter my apartment I start itching (fleas or not..). Ugh…. Anyway… Let’s talk about paper dolls. As far as paper dolls go, Pixie is pretty versatile. So, is Marisole, but perhaps because Pixie sets take fewer pieces (the average number of pieces on a Pixie paper doll set is 8 vs 11 for a Marisole Monday paper doll set), I tend to find them less intimidating. I also think the pose is easier to draw for. 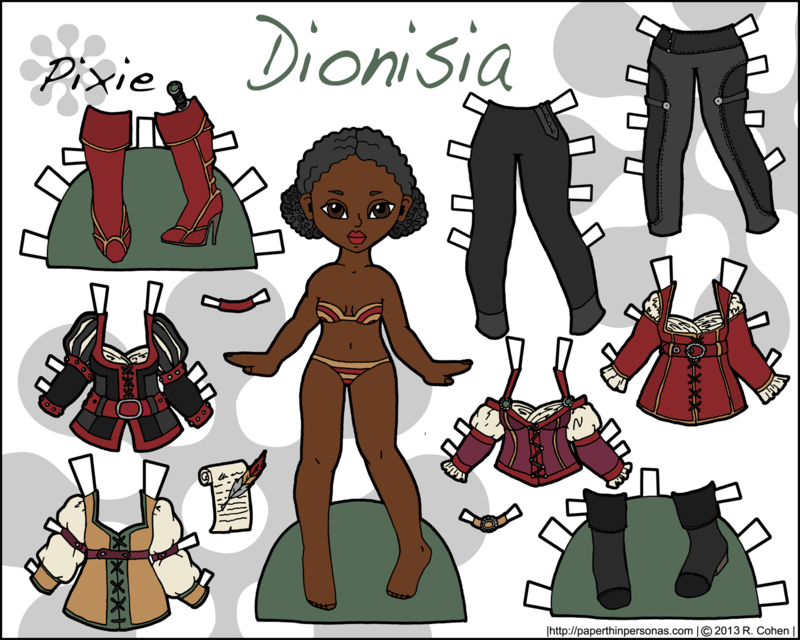 Anyway, I was inspired to do this paper doll set by the episode The Outsider (specifically Belle’s outfit here) from Once Upon a Time. I openly confess I haven’t gotten up the energy to watch the second half of the second season of that show. I enjoyed the first season, but the second season just got a little two soap opera complicated. Trying to follow three different plot-lines each episode was confusing and I found myself feeling like I just didn’t care enough about any of the people involved. I might not finish the season. I love the outfits! The black and red top on the left side is my favorite. I’ve watched Once Upon a Time too, and I finished it, but i never really watched it for the soap opera bits. I did not care so much about what happened to the people as to how the writers would change the fairy tales. And for Belle and Rumple, because that was adorable. I am really looking forward to Once Upon a Time in Wonderland though. Love it! I just recently started the first season…and finished it thanks to netflix. O have heard from several thw second season is not as good. The second season is not on netflix oe on demand. Grrr. But the new wonderland looks very fun! I really liked the first season, but I kinda lost interest in the second season. It felt far to soap opera. I really like the red boots. I really like almost all the clothes for the pixies, but not the dolls themselves….. They look a bit…… I don’t know….. Chubby…..